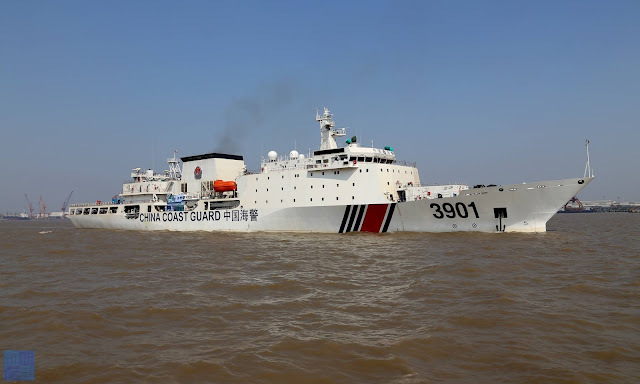 Cdr Salamander has been railing about those 10K Ton Chinese Coast Guard ships and to be honest I thought the dude spent a long weekend drinking something that he shouldn't have. Size matters at sea and those Chinese Coast Guard ships will be bullies against most ships...even warships (outside of open hostilities). Their size alone will ensure that. Kinda hard to bump hulls when the other guy is several tons heavier. I thought the lack of weapons made them just big targets. The Pacific is gonna be a whole new kettle of fish that I don't recall seeing in the history books. When its the beginning rounds of the beginning of the fight we could see a few crumpled hulls that we were counting on when the shooting war begins. Amazing isn't it? A relatively minor incident at sea (don't get me wrong the loss of life is tragic) is turning into a lesson of future warfare at sea (is this 4th gen warfare? )...low grade warfare, possibly guerilla warfare, maybe even a type of undeclared insurgency (the investigation should get to the bottom of the cargo ships erratic behavior) but however its classified the Navy will have to develop new protocols.